These seventeen (17) unpatented mining claims are located in the Canada Hill Mining District, Placer County, California. They cover approximately 820 acres and are contiguous. The original claims were filed in 1938, 1940 and 1945. Reports were written in 1937, 1939, 1948, 1953, 1980, 1985 and most recently 1993-94 by geologists and engineers knowledgeable and experienced with this region. The nearest town is 27 miles distant and the two lane Placer County road which comes to within a half mile of the mining site was paved by the county between 1983-1984 and is maintained by them. On these claims are two tunnels. The Mexican tunnel was dug sometime in the mid to late 1800's and is approximately ninety feet in length and four feet high. It was dug by hand, on bedrock and on an uphill angle and is located in a blue colored tertiary gravel deposit (channel) approximately 30 million years old. The Harris Tunnel (1952-56) is up hill of the Mexican Tunnel approximately 250 feet and was drilled and blasted through hard rock and into the same tertiary channel a distance of 150 feet where it makes a turn and proceeds downward toward the Mexican Tunnel, they are approximately 80 feet apart. During the late 1980's and 1990's an overall evaluation of the property was undertaken which included mapping out-croppings and areas of significant quartz deposits, road systems, taking and analyzing aerial photographs, sampling and studying the geology of the property. An in-depth seismic evaluation of the property was planned and accomplished on approximately 25 acres. 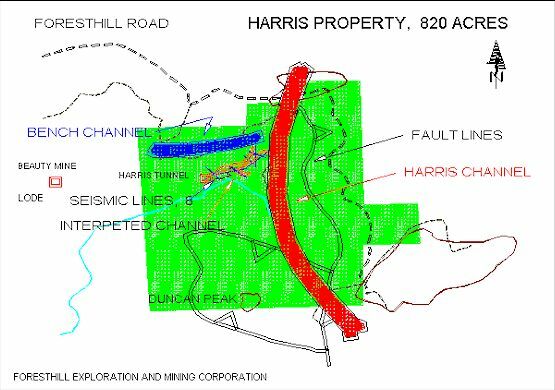 This Seismic evaluation has confirmed the existence of channels on the property and tied these channels from the Mexican tunnel through the Harris tunnel and north easterly approximately 1900 feet. The depths of these channels range from 30 feet to 50 feet below ground surface and the width of the channels on bed rock vary from 35 to 90 feet. We have a virtual picture and cross section projection of how these channels meander through this portion of the property. It is our intention to begin our work from the lower elevation at the Harris tunnel and follow the channels up hill. 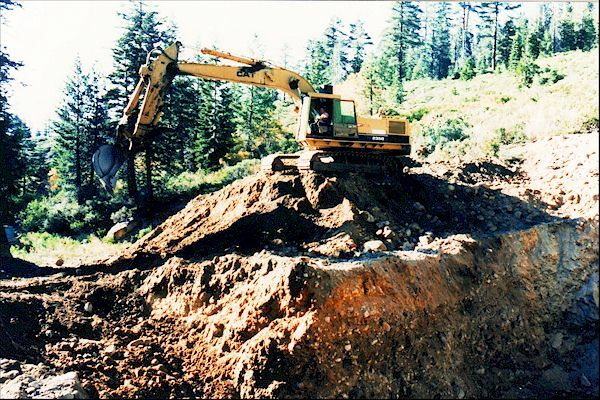 As with other properties it is difficult to determine reserves for placer gold mining operations. We have discovered gold bearing bedrock which indicates we could also have a lode deposit. We have been designing a drilling program to verify the size of this deposit. Approximately 25 of the 820 acres covered by these claims have been explored using 4,835 linear feet of detailed refraction seismic survey lines. 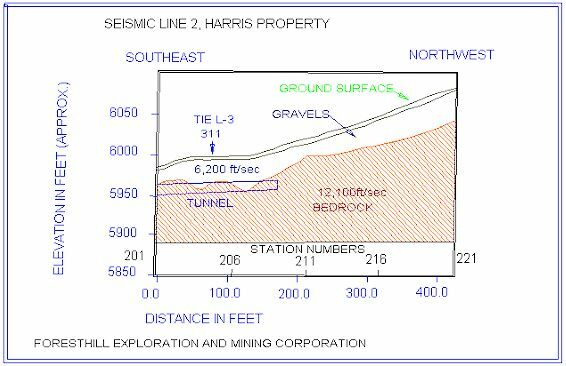 The seismic evaluation has disclosed the tertiary channel which is exposed at the mouth of the Mexican tunnel and underground in the Harris tunnel. The channel runs in a north easterly direction and our seismic work has verified approximately 1900 feet. There still remain approximately 795 acres that require exploration, this will be an ongoing task. An exploratory trenching program was started and bedrock was reached and approximately 20 linear feet was exposed. Gold nuggets were found laying on the top of and in crevices within the bedrock. From this location we will be starting a new adit (tunnel) to follow the channel upward through the Harris property. In blasting bedrock to reach the placer deposits, a lode bearing bedrock was uncovered, which assayed at 0.21 ounces of gold per ton of material. (Gold at $750/ounce equals $157/ton). It is commercially feasible to mine at mineralized values of less than $10/ton. This means that in addition to the placer deposit there appears to be a lode deposit on this property. We must now determine the extent of both deposits and modify the mining plan to optimize recovery of both. In the vicinity of the Mexican and Harris tunnels including the area of our seismic work there is in excess of 2,900,000 cubic yards of gravel to be mined. The value of gold in this area is difficult to estimate but this property could exceed 580,000 ounces. There is an existing exploration permit. The trenching program allowed us to dig an extensive pit exposing the bedrock walls as well as the channel floor. The bedrock uncovered was of black slate, softer than the surrounding andesite bedrock described by Phelps in his geologic report. The bedrock was impregnated with pyrite crystals which became larger as the channel floor was approached, approximately one inch square. 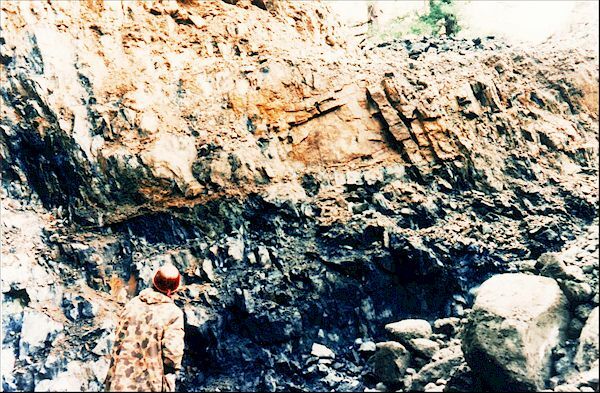 When the gravels become exposed to the air the pyrite or marcasite oxidizes rapidly to limonite, and in many freshly exposed banks the distinction between the upper red and the lower blue parts is prominent. The blue gravel is simply that in which the pyrite or the ferrous silicates have not yet been decomposed to limonite. As already stated, the placer gold of California is, as a rule, of a high degree of fineness. If it is assumed that this fineness, in the main Tertiary channels, is 920, this means, of course, that 92 percent by weight is composed of pure gold. The remaining 8 percent consists almost entirely of silver. The gold is a bright yellow, coarse, flaky, and smooth. The nuggets have been rounded. This is a premium jewelry gold. Panning has shown colors in the upper gravels. A 4,835 lineal foot, detailed refraction seismic survey has been completed on the subject property. Data was collected in the field and the data was reduced to workable drawings. The seismic lines were located in the field based on topography, exposed geology, previously printed information and related field selection parameters. All seismic data was recorded and high explosives were used as an energy source. Geophones were spaced at 10 to 25 foot intervals dependent on desired target and resolution. Elevation control included hand level differences at each geophone station tied to a base elevation at the portal (opening) of the Harris Tunnel. A total of 8 refraction seismic lines were completed. Geoseismic profiles have been generated for each of the seismic lines. These profiles show an approximate ground surface, low velocity and assumed bedrock profile. The thin near surface refractor horizon is typically 3 to 8 feet thick and ranges in velocity from 820 to 900 feet per second. Beneath this horizon is the layer of interest which typically ranges in velocity from 5200 to 5400 feet per second. Bedrock velocities calculated from all eight seismic lines range from 11,900 to 12,200 feet per second. It is the depressions, or lows, on this high velocity material surface which are interpreted to represent the ancient stream course. This interpretation is supported by exposed gravel/bedrock channel at the portal of the Mexican Tunnel and underground in the Harris Tunnel. An interpreted channel map has been generated. This channel map clearly suggests the typical braided stream pattern commonly found in the gold bearing Sierran Tertiary channel system. During the exploration trenching bedrock was blasted away to allow the excavator to go deeper into the earth. This bedrock was later tested and assayed at 0.21 ounces of gold per ton of rock. This bedrock was located under geophones 205-206, line 2. The picture below is a CAT-235 excavator beginning to dig an exploratory trench approximately 100 feet from the Harris Tunnel. This trench was dug to a depth of 45 feet. Work was forced to stop because of heavy snow fall, the project was completed to a depth of 55 feet the following year. This picture is of the same trench. It shows the black colored bedrock which was drilled and blasted to allow the excavator to dig a deeper trench. This bedrock was assayed and showed traces of silver and approximately 0.21 ounces of gold per ton of rock. This is approximately $157.00 per ton with gold selling for $750.00 per ounce. The sample was taken approximately 10 feet below the feet of the miner in this picture.